As predicted, the U.S. Federal Communications Commission on Thursday voted 3 to 2 along party lines to rescind net neutrality protections instituted under the Obama administration, potentially radically reshaping the nature of the U.S. internet. Under the a proposal championed by Republican FCC Chairman Ajit Pai, internet service providers will no longer be regulated like utilities and be free to block, throttle, or prioritize traffic. ISPs have lobbied for the change as enabling innovation, while critics such as Alphabet, Facebook, Reddit, activists, and some Democrats and Republicans have worried that it could discourage competition and infrastructure improvements, and lead to sites being arbitrarily kept behind paywalls. Many sections of the country also lack more than one ISP, making it impossible to switch to another provider if a customer is upset with pricing, restrictions, or service quality. "There is a basic fallacy underlying the majority's actions and rhetoric today: the assumption of what is best for broadband providers, is best for America. Breathless claims about unshackling broadband services from unnecessary regulation are only about ensuring that broadband providers have the keys to the internet. Assertions that this is merely a return to some imaginary status quo ante cannot hide the fact that this is the very first time that the FCC has disavowed substantive protections for consumers online," dissenting FCC Commissioner Mignon Clyburn said in a statement during the vote. 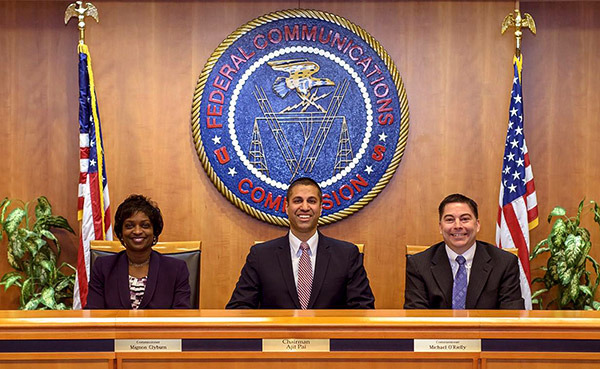 Pai has largely dismissed those fears, and the Commission decided to move ahead with the vote despite accusations that many of the 22 million public comments submitted to the FCC were submitted multiple times, and/or that as many as 2 million were faked. "It is not going to end the internet as we know it," Pai said. "It is not going to kill democracy. It is not going to stifle free expression online." Pai did note that FaceTime was a service at the core of proper internet functionality. However, during his remarks he neglected to mention that AT&T blocked it at launch, and danced around the FCC's rules at the time when explaining themselves to customers. Democrats have vowed to try and overturn the proposal, and while it has more Republican support, even many in that party have suggested that Congress should able to craft new rules, according to Reuters. Challenges may be raised in both courts and the political sphere. Apple could be impacted by the decision, given its growing dependence on cloud services such as Apple Music, iMessage, iCloud Drive, and the App Store. The company's push into 4K and original video might be severely hampered if throttling becomes widespread.